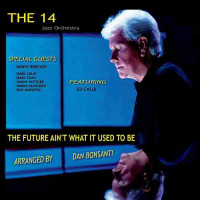 The Future Ain't What It Used to Be, the second album by South Florida's impressive The 14 Jazz Orchestra, is by and large like its precursor: swinging, straight-down-the-fairway big-band jazz underlined by leader Dan Bonsanti's admirable charts. As before, each of the songs was written by a blue-chip composer, from Chick Corea and Antonio Carlos Jobim to Wayne Shorter and Eliane Elias, and as before, every member of the ensemble is an alumnus of the University of Miami's well-respected Frost School of Musicthat includes Bonsanti and no less than nine special guest artists whose random appearances serve emphatically to enhance the outcome. Bonsanti arranged nine of the album's eleven themes and re-orchestrated the others (Jobim's "Triste," arranged by the late Bob Meyer, and Ron Miller's "Seventh Sign"). The orchestra closes with the album's lone standard, Sammy Fain / Irving Kahal's sentimental "I'll Be Seeing You," showcasing guest tenor Rick Margitza who also solos superbly on the amiable "Triste." The ensemble welcomes three guests on the spicy opener, Corea's "Armando's Rhumba," but none of them solos, leaving that assignment in the capable hands of Ed Maina (piccolo), Ed Calle (soprano sax) and pianist Jim Gasior. Meanwhile, guests Lee Levin (drums), Tim Smith (bass) and Richard Bravo (percussion) spare no effort to make sure the rhythmic pulse is strong and sure. Buster Williams' refreshing "Firewater," which follows, enfolds sharp solos by guest tenor Mark Colby, trumpeter Cisco Dimas and trombonist Dante Luciani, leading to a second theme by Corea, the assertive "Blue Miles," featuring Gasior, Maina on alto sax and Calle on tenor. "Triste" precedes Shorter's shadowy "Dance Cadaverous" (solos by Gasior and Luciani) and Elias' blustery "Pandamandium" (showcasing Calle on tenor and guest Randy Brecker burning rubber on trumpet and flugelhorn). For a change of pace, Bonsanti has some fun with Merle Travis' "16 Tons (Give or Take)," the original version of which was a mega-hit for the late balladeer Tennessee Ernie Ford. Animated solos on that one courtesy of (muted) trumpeter Ray Chicalo and baritone Peter Brewer. The serpentine "Seventh Sign" is next up (solos by Calle on soprano and Gasior on electric piano), and Bonsanti invariably leaves room for some funk, in this case Jaco Pastorius' savory "Rice Pudding," spotlighting trumpeter Brecker, tenor Calle and guitarist Tom lippincott . Calle and Gasior solo once more on the second of Miller's engaging compositions, "Ruth," the entree to "I'll Be Seeing You," which is brightened by Margitza's evocative tenor and Bonsanti's adept arrangement. 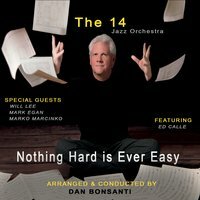 In reviewing the orchestra's debut recording, Nothing Hard Is Ever Easy (Self Produced, 2015), the observation was made that it "enfolds the promise of enterprising musical adventures yet to come." And so it has. While there isn't much to separate the two, The Future is endorsed by the slimmest of margins. Instead of asking why, the counsel here is to listen carefully to both and shape your own opinion. Track Listing: Armando’s Rhumba; Firewater; Blue Miles; Triste; Dance Cadaverous; Pandamandium; 16 Tons (Give or Take); Seventh Sign; Rice Pudding; Ruth; I’ll Be Seeing You. Personnel: Dan Bonsanti: leader, arranger; Jack Wengrosky: trumpet; Steve Reid: trumpet (2, 7, 10); Cisco Dimas: trumpet (1, 3-6, 8, 9, 11); Ray Chicalo: trumpet; Ed Maina: alto sax, flute, piccolo; Ed Calle: tenor, soprano sax, flute; Neal Bonsanti: tenor sax, English horn, flute, clarinet (1, 3-6, 8, 9, 11); Peter Brewer: baritone sax, bass clarinet, flute; Dante Luciani: trombone; Major Bailey: trombone; Jim Gasior: piano, keyboards; Tom Lippincott: electric guitar; Matt Bonelli: electric bass (1-5, 7, 9-11); Jack Ciano: drums (2-5, 7, 10, 11). Guest artists – Randy Brecker: trumpet (6, 9); Mark Colby: tenor sax (2, 7, 10); Rick Margitza: tenor sax (4, 11); Tim Smith: electric bass (6, 9); Mark Egan: fretless bass (8); Lee Levin: drums (1, 6); Danny Gottlieb: drums (8); Marko Marcinko: drums (9); Richard Bravo: percussion (1, 6).